It’s hard to deny that the effects of weed can make you feel great when you have things to do stoned. Food tastes better, music sounds amazing, even the colors seem to jump out at you and more appealing to the eye. Your body tends to slows down and you can really appreciate life at a whole new speed. I mean, have you ever hiked while stoned? Simply looking at your surroundings and seeing the flowers grow from the earth, humming birds casually flying buy. A bunch of hippy- dippy talk. But it’s so true, there happens to be so much truth to this ”hippy-dippy” talk. Take into consideration the details you notices while stoned. The physical world around you seems to change almost to a point of being reborn, it is a feeling so unique, you must experience it for yourself to understand. It’s the euphoric feeling. The feeling of complete bliss. So lets get into this “hippy-dippy” thing. What are some beautiful things to do while stoned? Cooking a great meal: Most of my best dishes are made while stoned, something about putting on some dinner tunes ( something jazzy) and getting lost in the kitchen to my spices, veggies and various items just gives me the best meals. One day, explaining to my non smoking family, I noticed their faces. They were all laughing at me. As I explained to them how it feels to slice into the pepper. The crunch of the carrot hearing the sizzle from the pan, coconut oil melting in the pan the smell of the foods while being mixed together… well I could just go on, when I stopped and looked at them it was clear as day. It was “hippy-dippy” talk. I gave myself a good chuckle. It was like a scene from a “ typical pot” movie. Finger paint: I’m quite lucky in this part. A mother to a very artistic son, I bought him a Buddha board and we tend to enjoy a little art together. But why finger painting? Its messy, it gets every where, constantly having to wash you hands when switching colors. Most people I talk to about finger painting would rather use a brush. The reason I love using my hands is not only am I a physical person, but it’s the idea of letting the paint do what ever. It becomes a dance. Letting go, stepping away from “proper’ color and just letting your fingers dance across the page. It gives me a smile as I think about it. Its just.. peaceful. Garden: Dirt in my hands fresh air from the plants, it just feels good be stoned and planting. It gives off a clean feeling. Plants purify the air the dirt gives off the earthy smell, and the feeling of it slipping through your fingers and planting new life into the earth. Myself, I have over 30 plants, 3 times a month I take them down bathe them washing their leaves and give them some tender love and care. Putting them back in place or even rearranging them I can feel a new energy sweep around my house. Yoga: Yoga is the one activity/ workout I can do stoned. We all know how good music is while high, we’ve been to concerts/ festivals stoned and it just feels good. We get lost in the music and sounds around us. Zening or zoning out, letting the music move our body’s in anyway it feels. Energy flowing through you. Yoga is like dancing, I love smoking a j putting on my go to yoga tunes turning out the lights. Just letting the movement talk for my feelings. Pushing out negative energy and bringing in peace kindness and love, here rim able to forgive and let go. Leaving my soul peaceful and full of gratitude. There are a lot of things to do while stoned and they all have different effects on the body. I’m not the one to say that these 4 things to do while stoned are the best. But I can vouch for each one of them. If you were to ask me what my favorite thing to do while stoned it would be yoga, write and garden. Just a bunch of “hippo- dippy” stuff. 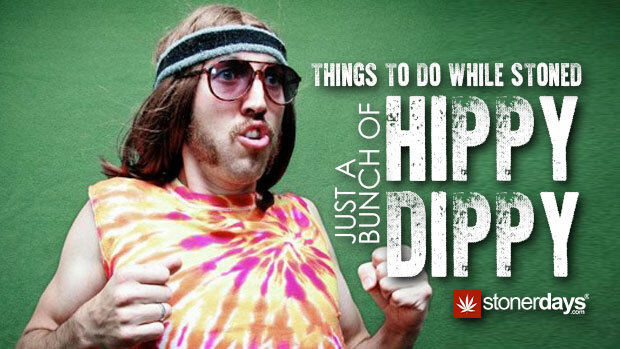 This entry was posted in Featured, Stoner Guide and tagged hippie dippie, stoned, THINGS-TO-DO-WHILE-STONED-HIPPY-DIPPY.